The Yukon government is looking to cool the crawl space for the Ross River School, something that could see it fork over up to $1 million for work slated to start this summer. Doris Wurfbaum is a Department of Highways and Public Works (HPW) spokesperson. She confirmed this morning that construction is to take place this summer, after a forecast was posted earlier this week to the government’s tender management system. That work is “to help manage the movement in the foundation of the school,” Wurfbaum wrote today. That “includes adding mechanical cooling and insulation to the building’s crawl space,” she noted. While just a forecast at this stage, it pegs the estimated cost between $100,000 up to that $1 million figure. Meanwhile, the forecast comes just under four months after HPW Minister Richard Mostyn assured that the site was safe and structurally sound, citing an engineer analysis from February 2018. Mostyn added last October that the government was monitoring the site by having a structural engineer, survey team and architect with expertise in permafrost look at the school. He also vowed there would be at least two site visits by the monitoring team every year. Troubles at the school date back years: after replacing an older building by opening in 2001, its ground began to shift because of thawing permafrost. The school cost around $7.1 million to build. Much of the community is built on permafrost that thaws in warmer temperatures and refreezes during the winter, inevitably interfering with the infrastructure in place. Past reports show it has resulted in cracked drywall and windows, jammed doors, gaps in ceiling tiles and sloped classroom floors. The building already has a thermosyphon system, which aims to cool the ground by pulling heat away from the foundation and its nearby soil, but reports have shown that the crawl space is still warm. Back in 2015, the school was closed for five months before it was re-levelled – which came with a nearly $2-million price-tag. And as of mid-2017, Mostyn noted various repairs and studies about the school, which houses students in kindergarten to Grade 12, have cost about $3 million since 2002. Meanwhile, Wurfbaum added the tender itself with details is expected to be posted sometime later this month. The same engineers who designed the failed thermosyphon system at the RossRiver school also designed the failed thermosyphon system at the Dawson City rec centre. In both cases these 'engineers' went against 'conventional wisdom' and proven building practice and placed a heated crawlspace in permafrost. The government did nothing about this liability despite the fact that engineers are required to carry 'fault insurance' to cover their mistakes. They spent more on that questionably useful footbridge there than fixing up the school. Who was the foundation engineer on this project? They must have a caveat that removes any blame if the thing fails. Is there no responsibility taken by any involved except the government? Their responsibility is to just spend more taxpayers money to try and fix it. Is this new fix guaranteed to work? Sort of makes you wonder, with all the foundation isssues at the Whistle Bend Care Center, how much will we be on the hook for with that one. 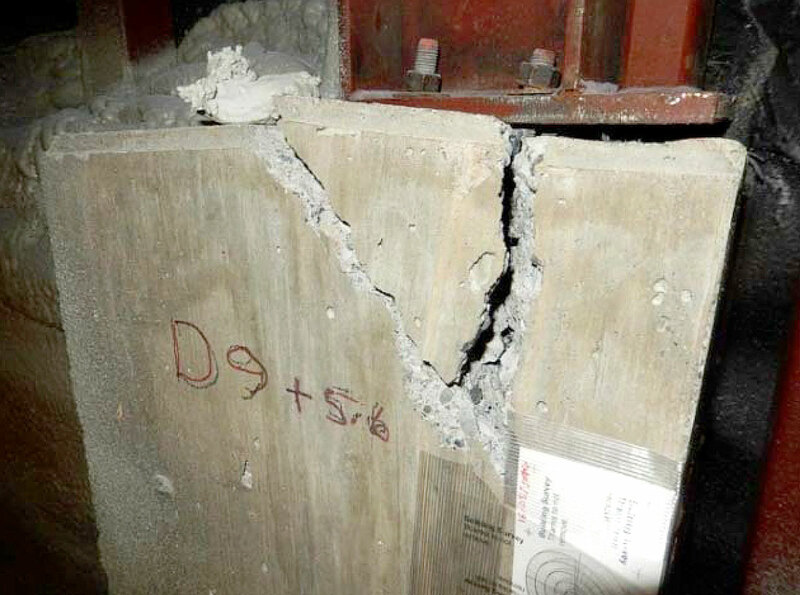 Looks like they had that vertical supporting beam well centered. Quality workmanship with our tax paying dollars.